Transparency Market Research identifies Merck & Co., Inc., Eli Lilly and Company, Novartis AG, Pfizer, Inc., Amgen Inc., Novo Nordisk A/S, Lupin Pharmaceuticals, Inc., and AstraZeneca as some of the leading players operating in the global women’s health market. The market is highly fragmented due to a strong presence of several local vendors. Mergers and acquisitions, research and development, and product innovations are expected to be some of the key strategies of these companies in the forthcoming years. Beyond cancer, these companies are also expected to focus on osteoporosis and conditions such as endometriosis to tap into the market potential of both developing as well as developed countries. 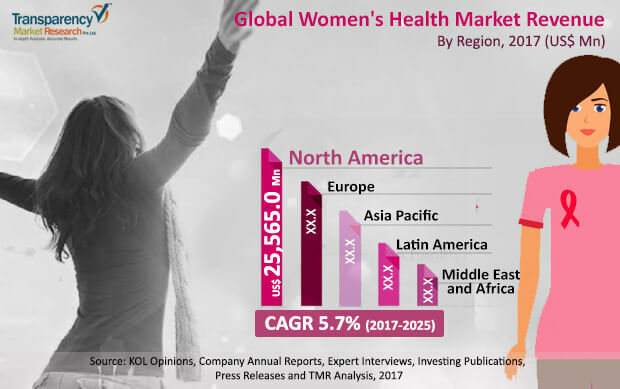 According to Transparency Market Research, the global women’s health market is expected rise at a CAGR of 5.7% during the forecast period of 2017 and 2025 to climb up steadily from US$58.05 bn in 2016. Out of the various treatments, the non-hormonal segment is expected to hold a significant share in the overall market. The wide range of products in addition to a strong pipeline are expected to favor the rise of this segment. Regionally-speaking, the global market will be led by North America due to growing government expenditure on healthcare. The high incidence of cancer is expected to be the key growth driver for the global women’s health market. Cancer disease indication segment of the global women’s health market is anticipated to hold major market share owing to rising incidences of breast cancer globally. World Cancer Research Fund International has ranked breast cancer as the second most common cancer globally, with an addition of nearly 1.7 million new cases in 2012. This trend is likely to be a major driver of the breast cancer therapeutics in the women’s health market, which is anticipated to expand at a high CAGR during the forecast period. The market estimates for the breast cancer therapeutics by geography are further supported by the data from WCRF International for geographical variations in survival trends in breast cancer across the globe. The study by WCRF considered survival rates were for breast cancer patients who underwent treatment and were alive for five years post diagnosis. Demand for various treatments for women’s health will be high in developed economies due to a high expenditure on healthcare. Furthermore, better rate of awareness in these regions is also expected to make a significant contribution to the overall market. The alarming survival rates in developing parts of the world are also expected to augment the demand for women’s health products in the forthcoming years. Breast cancer incidence rates still remain higher in developed countries. Strong presence of research and development labs around the world have also been anticipated as key growth drivers for the overall market. On the flip side the global women’s health market is expected to face a few challenges. The potential side effects of using treatments under the umbrella of women’s health market is dissuading buyers. Furthermore, a wide market of alternative medicine for treating several health issues that women face is also projected to have a negative impact on the overall market in the near future. The intensifying wave of health and witness, which is driving women to seek a holistic path toward a better life is also expected to hamper market growth. This review is based on Transparency Market Research’s report, titled “Women’s Health Market (Treatment Type - Hormonal Treatment (Estrogen Therapy, Progestin Therapy, Combination Therapy, Thyroid Replacement Therapy, Parathyroid Hormone Therapy, and Others) and Non-Hormonal Treatment (Targeted Therapy Drugs, Antibiotics, Bisphosphonates, and Others); Disease Indication - Cancer (Breast Cancer, Cervical Cancer, Ovarian Cancer), Hypothyroidism, Post-Menopausal Syndrome, Osteoporosis, Contraceptive, Uterine Fibroid, Urinary Tract Infection, and Others) - Global Industry Analysis, Size, Share, Growth, Trends, and Forecast 2017 - 2025”.